Happy Birthday Dr. Seuss!! To celebrate what would have been Dr. Seuss’ 108th birthday we made a simple craft inspired by his book. This a simple, cute, fun project to do with your preschooler. Trace their hand on different colored construction paper. Have them make a mouth & eyes (or use googly eyes) on the hand. 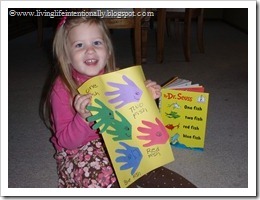 We made this craft to go along with a classic “One FIsh, Two Fish, Red Fish, Blue Fish” by Dr. Seuss.